After a year (or is it 11?) 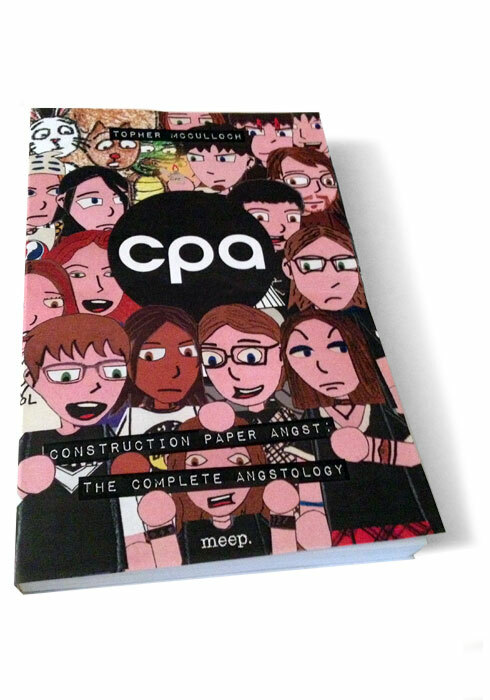 of blood, sweat, and tears, Construction Paper Angst: The Complete Angstology is complete…ish. You can preview the entire thing on Blurb, or, better yet, buy it on dead trees. It contains every non-filler, non-guest strip as well as the Angstémon strips from 2009. It even includes a few new strips tucked in randomly to fill in some gaps. Nearly all of the lettering had to be redone. I took out Freakazoid and the Old Lady Puppet. I erased the Fooniverse. It makes about 5% more sense than it did in its original form. Some artistic shortcuts were also fixed. It’s not quite George Lucas levels of authorial revisionism, but there are changes. I’m not sure yet if I’ll redo the archives on this site. They remain as-is for the time being. I’m also thinking about new things. This entry was posted on Thursday, October 25th, 2012 at 9:37 pm and is filed under comic. You can follow any responses to this entry through the RSS 2.0 feed. You can leave a response, or trackback from your own site.